I’ve been dreaming for a while about finding that piece of living room furniture that would finally take me out of college. I’ve been done with architecture school for a while, but as long as I had the wood futon that I’d stained cherry myself (poorly), and which had occupied my freshman dorm, my living room would always feel like East Campus freshman housing. I’ve long wanted this amazing 60” settee that I visit every once in a while at Lewis and Sheron, a fabric store (and general designer resource) on the west side of Atlanta. For only $1395, less designer discount, plus the cost of fabric, the settee could be mine! Allen wasn’t on board. Shabby as the futon was, I wasn’t interested in buying a cheap placeholder that I’d want to replace in a few years, so I’ve been waiting it out. Perhaps reacting to the bleakness of the job market, my parents-in-law had given me a book on DIY upholstery for my recent graduation. So I’d been waiting for a yard sale find on which I could try my hand at reupholstering, and hopefully get a revamped living room out of it. I finally spotted a settee at a yard sale that was sized perfectly to replace the twin-size futon (50” long), and I bought it for fifty bucks. It was in wretched shape, covered in water stains (I hope they were water stains), and the seat cushion had somehow shrunk (you actually see this a lot). I figured that if I spent $100 on fabric, $80 on other materials, and $100 on tools, I’d be doing pretty well to have a fresh new settee for just over $300. Shockingly, my final costs worked out pretty close to that. The settee came home and went to live on our awful prefab aluminum “sun room” known colloquially as the Abomination (Ed. note: When viewing photographs, please forgive us the Abomination. It was here when we moved in). On a hot day, I began to tear the settee apart. The book I was using as a guide is “Reupholstering at Home,” by Peter Nesovich, and it was practical and fantastic. I ordered a few supplies, on the book’s suggestion, including a tack hammer, a staple puller (Nesovich prefers the one from Berry), a webbing stretcher, various-sized straight needles, curved needles, and also a fancy-looking syringe needle that I thought I might need for tufting (I did not). I also ordered cotton batting, jute webbing, upholstery tacks, and burlap (I ordered after I had partly uncovered the settee, so I had a feel for what I would need). There are dozens of online upholstery stores, with fairly consistent prices. I ordered online from DIY Upholstery Supply. Both times I've ordered, I've had a hell of a time actually getting my stuff, which is an important part of the online ordering process. I'll try another vendor next time. I should have waited to uncover my settee until I had my tools (but I couldn't wait three weeks), because a proper staple puller would have helped so much. A tack puller is not the same thing. Nonetheless, after much work and some pretty deep scratches, I had most of the staples out, and the old fabric off. If you’re smart, and you get a staple puller, just slip it under each of the staples and pull it out slowly. Otherwise, your staple could split, and you’ll be pulling each end out with pliers – or not – and then your arms will be covered with tetanus-y scratches from every time you brush against a staple-end minefield. Pull out as many staples as you can (my settee had the rusty detritus of at least one other reupholstering job), as it will be easier to attach your fabric to a clean, smooth surface. Keep the old fabric so that you can trace each of the panels onto your new fabric. 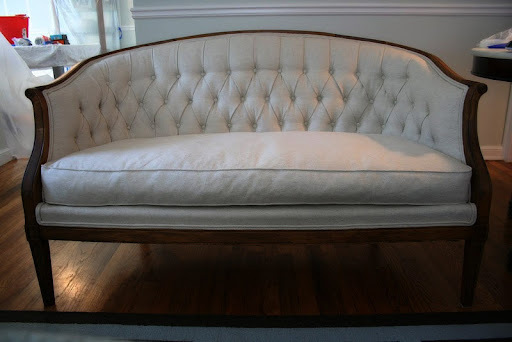 If your piece is tufted, keep at least a few buttons. As you remove buttons, mark the places where the fastening twine came through to the back. Measure the yardage of the gimp, double-cording, or whatever your piece is trimmed in, and write it down. Plan to add an extra yard to that measurement when you have it made or make it yourself. Reupholstering is really intuitive. After removing the dustcover from the bottom (this will always be your first step), my book instructed that the fabric be removed from the back of the piece. Looking at the settee, or most pieces of furniture, that’s the only place to start – it was the only fabric not tucked into other fabric. Just go step by step, first pulling off any glued-on double-cording or gimp trim, then continue by removing whatever fabric panel is on top at the time, and then the next one. Remove the dust cover (cambric) from the bottom. This is stapled to the edges of the sofa bottom. Remove double-cording (the simple trim that resembles a figure-8 in section) from the entire settee. This is glued on. Remove the fabric panel from the back. This is stapled around the top and side edges of the sofa, next to the wood. At the bottom, it is stapled under the sofa. Remove the cotton batting from the back. This is stapled the same way as the fabric, and it naturally holds on to the burlap underneath it. Remove burlap from the back. This is stapled the same way as the fabric. Remove the tufting buttons. Be sure to mark (as I did in tape) where the button twine came through to the burlap in the back (not the burlap you just removed – there’s another layer). Remove the fabric from the front and inside-arms (in this case, it was contiguous). At the top, this was stapled to the top and side edges of the sofa, just below the wood. At the bottom, it goes under the wood framing for the sofa back, and is stapled to the bottom framing member. Remove the batting from the front and inside-arms. At this step, my process may differ with some others. Since the foam that shaped the tufted seat was in good shape, and since I knew I couldn’t replicate it, I left it. Next, remove the fabric from the seat panel (the piece of fabric that the loose cushion sits on). At the front, this was stapled to the front framing member, just above the exposed wood. At the sides and back, it staples to the top and sides of the bottom framing piece, under where the front fabric was stapled. Remove the cotton batting from the seat. This is probably loose. Remove the edge-roll. This is a pieced of semi-hard material wrapped in burlap that helps cushion the front framing member. It's probably nailed in, and can be pried out. Hold onto it if it's in good condition. If not, you can order it online. Remove the burlap from the seat. This is stapled the same way as the fabric was. Removing the burlap should expose the coil springs. They may need retying. In this case, some of the spring ties had come loose, due perhaps to the fact that many of them were not tied eight ways. I took another shortcut here that probably helped me. I’m obviously no pro, so instead of untying all the springs that were in perfectly good shape, I addressed problem areas only. The ties had shifted on most of the springs on the front row, so I added another set of ties to each one. The back left corner was untied, so I retied that one, as well. I tied the springs in a way that would reinforce the ties that were already in place, but which may have shifted. Peter Nesovich has a great set of spring-tying diagrams in his book, but the bottom line is that you want eight knots, regularly spaced, around each spring, and you want all the tops of the springs to be even in height (unless you’re doing a piece without a loose cushion, which is a different story altogether. Turn the settee upside-down to survey the webbing. In this case, the springs were affixed to a piece of burlap that sat on top of the webbing, so I was able to re-web without disturbing the newly-tied springs. If this is not the case with your project, your last few steps may vary a little from mine. All my webbing was loose, so I pulled out all the tacks and removed the old webbing. I cut lengths of new jute webbing to match, allowing about 8” of excess length, and laid them across the bottom the same way the old webbing was configured, weaving in and out like a lattice. Make sure that your webbing sits directly underneath each row of springs, as it’s the webbing’s job to support the springs. Starting with the webbing in the center, double the end of the webbing over on itself (about 1-1/2"), and attach it with five staggered upholstery tacks. Push the teeth of your webbing stretcher into the other end of the webbing, and pull the webbing taut by placing the tool against the side of the settee and rotating the tool downward. If you’re doing this on exposed wood, be sure to place a cloth rag between the wood and the tool, so as not to damage the wood’s finish. Nail the end of the webbing in place with three tacks. It’s good to have a partner for this, so that someone can use both hands to nail in the tacks, while you continue to hold the webbing taut. Trim the end of the webbing, leaving about 1 ½” overhang. Double the overhang back on top of the webbing, and secure with two more tacks. Repeat this process for all the webbing, starting from the middle and working your way out. Taking pictures as I went allowed me to illustrate this tutorial, but it also let me go back and reference the way my settee was put together in the first place – how the pleats were arranged, how much batting went over the cushions, et cetera. Document all of your steps with photographs, and putting the thing back together should be no problem. You may also want to keep a careful eye out for bugs. I’ve heard about the bed bug infestations in major cities, read the Apartment Therapy posts on bird mites, and entertained diatribes from my hairdresser about roommates who bring home scabies-infested armchairs. This was enough to have me ready to toss the settee out to the curb every time a June bug entered the vicinity. I had bites all over my legs, and I felt my skin crawling. The thing was, I had also recently gone camping, stood briefly in an anthill, was currently working in a semi-enclosed space swarming with mosquitoes, and am mildly crazy. The settee has been living indoors for weeks now, and everything’s fine. There is a lot that can be imagined, if one is prone to such things, and impressionable by scary and sensational stories. But that’s no reason not to throw out the sofa and burn every piece of clothing that you own if you do find eggs or a 1mm-long, translucent, tan critter. I will be posting the next portion of this process description soon – it will cover the stripping and refinishing process. Looks FANTASTIC! The pictures make it seem like there are quite a few of the old staples left on the piece (I'm having this trouble--rusty staples don't want to budge). Did you have any trouble stapling over the old staples, or did you end up getting them all removed? I ended up leaving a lot of them. This settee had obviously been reupholstered several times, and it had the staples to prove it. I'd say I got about half of them out. If you get a lot of them out, it will make it a little bit easier to staple on new fabric later - but it won't make a huge difference. At some point, you just gotta call it quits and move on. I have an antique chair in which the webbing is covered only by a dust cover. Some of the webbing pulled away from the bottom frame and the springs are now popping through the bottom. Can I simply replace the webbing. I really do not want to reupholster the chair or replace the springs. Will this lazy man's approach work? He helped me with some chairs I was struggling with. I have no idea how he has the time to answer questions from all these strangers, but he's wonderful to do it.